After a successful launch of MAP of MUSEUMS of AHMEDABAD Team “Museums of Ahmedabad” shall represent all the Museums of Ahmedabad for Museum Week 2017 online via twitter, facebook, instagram, LinkedIn. 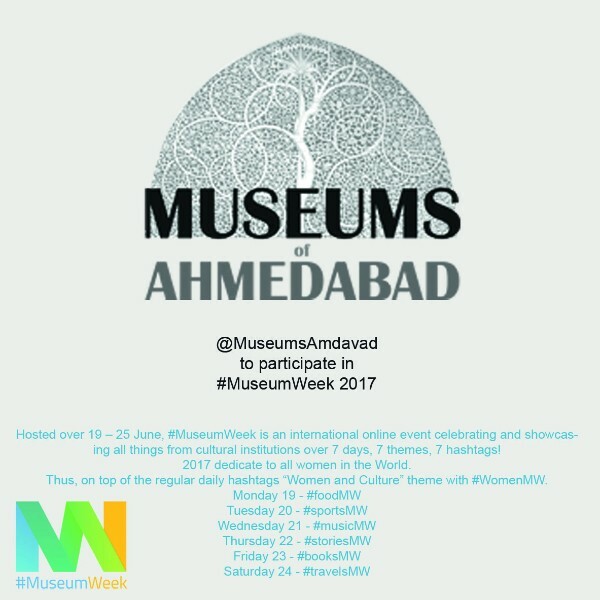 Join them for #museumweek 2017 @MuseumsAmdavad museums-of-Ahmedabad hosted over 19 – 25 June, #MuseumWeek is an international online event celebrating and showcasing all things from cultural institutions over 7 days, 7 themes, 7 hashtags! 2017 dedicate to all women in the World. Thus, on top of the regular daily hashtags “Women and Culture” theme with #WomenMW.